LOS ANGELES — The best team in the Western Conference said from the outset that it would take a good two months to figure out the squad’s true potential. Harder to predict would have been its lofty perch atop the standings as that true potential arrived. When the Los Angeles Clippers host the Phoenix Suns on Wednesday, they will do so as the best team in the west. Not a year removed from the departure of Blake Griffin, the face of the franchise, the Clippers are winning with tenacious defense, a never-quit mentality and a roster full of hard workers over superstars to post a 13-6 record. Except that forward Tobias Harris has continued to garner some of that superstar attention. The reigning Western Conference Player of the Week averaged 24.8 points last week as the Clippers went 3-1. It’s raining threes early at Viejas! Devin Watson… Nothing but nylon! When the Clippers stormed back from a double-digit deficit at Portland on Sunday to move into the conference’s top spot, Harris tied a career high with 34 points. With scoring guard Lou Williams playing through illness last week and then struggling to find his shot as his health improved, Harris seamlessly filled the scoring void. 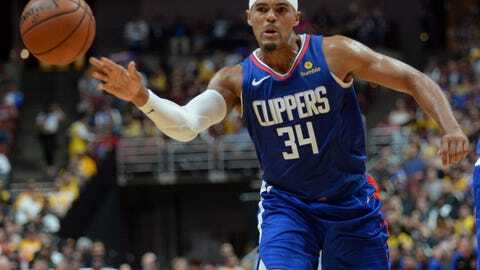 Harris’ willingness to defer to Williams when he is hot, and his ability to take big shots when he is not, is the kind of selfless mentality that has defined the Clippers. It has been an all-around effort for the Clippers, who have established the identity of coach Doc Rivers by posting a 107.6 defensive rating — 12th best in the league. That is complimented by a scoring average of 116.8 points per game — fourth best in the NBA. It is the kind of all-around effort the Suns hope to achieve one day, but so far, their rebuilding season has fallen well below expectations. The Suns enter Wednesday’s game with a 4-16 record as they sit last in the conference. Former Clipper Jamal Crawford is trying to provide veteran leadership and guidance, and while it has been an uphill climb, the fearless guard does see some progress. The Suns gave the Pacers all they could handle at home Tuesday, tying the score 104-104 on a 3-pointer by Devin Booker with 45 seconds to play, before Indiana finished off the victory. T.J. Warren scored 25 points in the defeat. Suns rookie center Deandre Ayton continues to emerge, adding 18 points Tuesday. Ayton became the fourth player since 1992 with at least 300 points and 200 rebounds in his first 20 games, joining Griffin, Tim Duncan and Shaquille O’Neal. The Clippers are expected to be without Luc Mbah a Moute (sore left knee) and Jerome Robinson (strained right foot).